In the first decade of the twentieth century, the sleepy vineyard towns of the Aude department of southern France exploded with strikes and protests. Agricultural workers joined labor unions, the Socialist party established a base among peasant vinegrowers, and the largest peasant uprising of twentieth-century France, the great vinegrowers' revolt of 1907, shook the entire south with massive demonstrations. In this study, Laura Levine Frader explains how left-wing politics and labor radicalism in the Aude emerged from the economic and social transformation of rural society between 1850 and 1914. She describes the formation of an agricultural wage-earning class, and discusses how socialism and a revolutionary syndicalist labor movement together forged working-class identity. Frader's focus on the making of the rural proletariat takes the study of class formation out of the towns and cities and into the countryside. Frader emphasizes the complexity of social structure and political life in the Aude, describing the interaction of productive relations, the gender division of labor, community solidarities, and class alliances. Her analysis raises questions about the applicability of an urban, industrial model of class formation to rural society. 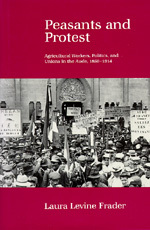 This study will be of interest to French social historians, agricultural historians, and those interested in the relationship between capitalism, class formation, and labor militancy. Laura Levine Frader is Associate Professor of History and Coordinator of the Women's Studies Program at Northeastern University. She contributed to and translated The Vine Remembers: French Vignerons Recall Their Past (1985).